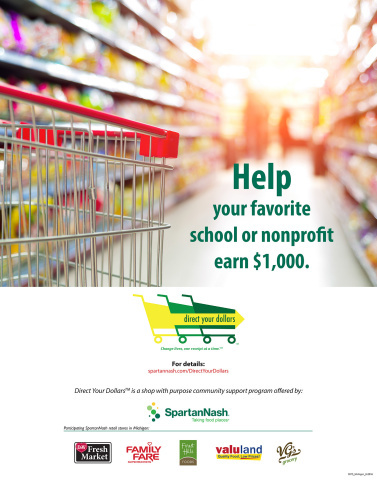 Store guests will soon have a new way to support their favorite local charities, schools and other nonprofit organizations through the SpartanNash program, Direct Your Dollars™. The receipt-based program makes it easier than ever for eligible nonprofit organizations to earn $1,000. Direct Your Dollars launched on Aug. 1 in more than 160 SpartanNash-owned retail stores and fuel centers in nine states. "Our Direct Your Dollars™ program is built on the concept of shopping with purpose, meaning our store guests can use their purchasing power to support their favorite nonprofits," said Dennis Eidson, president and CEO of SpartanNash. "The Direct Your Dollars program allows local nonprofit organizations to turn receipts into dollars for computers, textbooks, field trips, athletic and band equipment, food and meal supplies and much more – just by shopping at any one of our retail stores. For many, it's a familiar program with a new name, and we're excited to expand our corporate responsibility to our communities through Direct Your Dollars." Direct Your Dollars™ replaces the Support Our Schools program offered in some of the company's west stores and the Michigan-based Cash for Class program. Shop any of SpartanNash's corporate-owned stores. A section titled "Direct Your Dollars" will be included on all receipts to make it easier for organizations to compute their Direct Your Dollars receipt totals. Some purchases are excluded from the Direct Your Dollars program, such as tobacco, postage, fuel, gift cards and lottery, and will not be included in the "Direct Your Dollars" tally. Receipts from any SpartanNash-owned store – including Family Fare Supermarket, D&W Fresh Market, Family Fresh Market, Forest Hills Foods, VG's, SunMart, Supermercado Nuestra Familia, Bag n Save, No Frills, Prairie Market, Pick N Save, Germantown Fresh Market, Dillonvalle IGA, Econofoods, Dan's Supermarket and ValuLand – will be accepted and must total $150,000 before a check will be issued. SpartanNash (Nasdaq: SPTN) is a Fortune 400 company and the leading food distributor serving U.S. military commissaries and exchanges in the world, in terms of revenue. The Company's core businesses include distributing food to military commissaries and exchanges and independent and corporate-owned retail stores located in 47 states and the District of Columbia, Europe, Cuba, Puerto Rico, Bahrain and Egypt. SpartanNash currently operates 160 supermarkets, primarily under the banners of Family Fare Supermarkets, Family Fresh Markets, D&W Fresh Markets, Econofoods, and SunMart.